This device is a high tech ultrasonic sensory system which is fitted onto the 4 corners of the front and rear bumper. 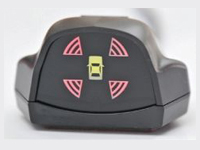 It ensures safe, accurate and easy parking in all situations and to provide object detection in every corner of the vehicle. The system will only be activated when the power switch is ON and indicated by the display with LED light-up. Utilizes the latest asymmetric sensing technology with 160° horizontal sensing ability.